The Captain's Daughters is pleased to partner with fine retailers, cafés, restaurants, and hotels to offer our line of bespoke teas at locations near you. You'll find a curated assortment of The Captain's Daughters tea as part of Yolqueria's beverage offering. Standing tall in the East Side’s commercial center, Strangers & Saints is a modern interpretation of a portside tavern – blending the history of sea captain salt, swank and swagger with the deep sense of hospitality, food and drink. The Captain's Daughters tea is offered on the menu in addition to finely crafted house-made cocktails, small and large shareable plates, wine and local beer. A chef-owned petite hotel, 8 Dyer in Provincetown, MA is a haven of serenity for body and mind. 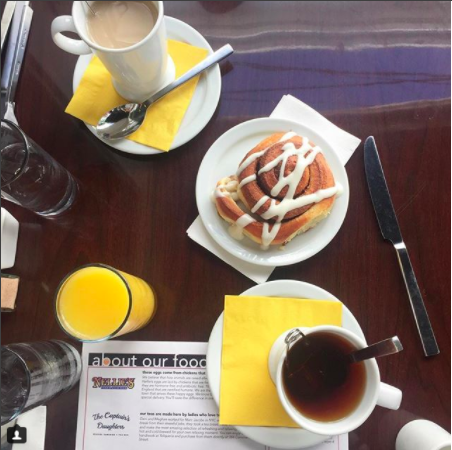 Steps from Provincetown's best shopping, scenic seashore and lively night life, 8Dyer offers a full gourmet breakfast including a carefully selected range of The Captain's Daughters tea. Patch NYC, their South-End based boutique boasts an eclectic mix of fashion accessories, home decor, and gift items including The Captain's Daughters Tea. SAULT New England is located in the South End of Boston. They carry mens clothing, mens accessories & and curated collection of stationery and gifts for guys. For Holiday 2017, Sault opened a women's holiday gift shop around the corner on Shawmut Ave featuring women's ready to wear and gift items including The Captain's Daughters tea for the month of December. Mott NYC is a Men's concept store by art photographer John Arsenault and menswear designer, R.Swiader boasting a “collection of their favorite things for your life”. The store is a 600 square foot space mixing art gallery, home objects, clothing, accessories and a two chair barber shop. The Captain's Daughters tea is proudly offered for sale and as part of beverage service for barber shop guests. Kristen Coates is a full service art agency offering brand management, curating, sourcing, hanging and overall art-love-well-being. 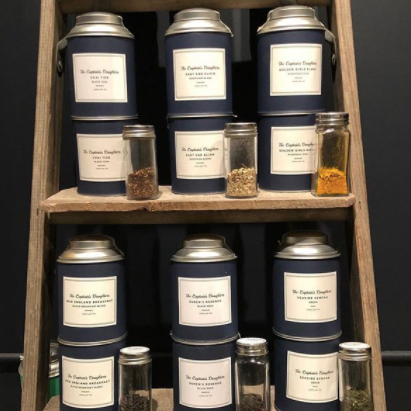 In addition to her role as an art curator, Kristen Coates has expanded to a full lifestyle brand including home decor, entertaining and a new home collection including The Captain's Daughters teas. Visit the shop in Newport, Rhode Island for a truly inspirational experience. ShopSCAD exclusively features the work of students, professors, staff and alumni of Savannah College of Art and Design. 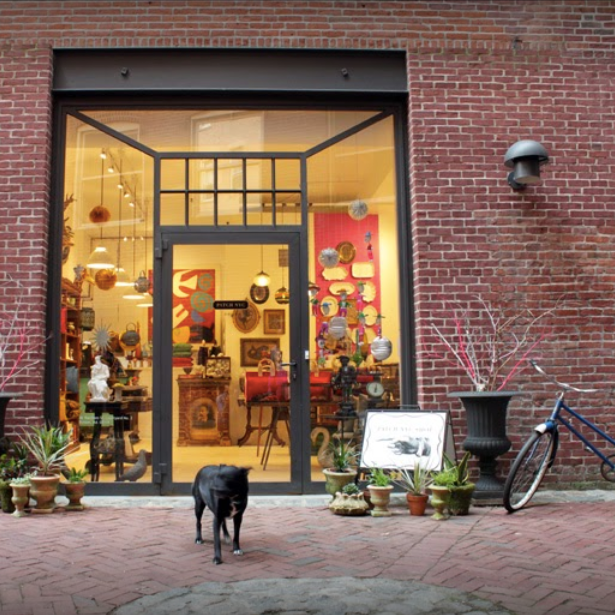 ShopSCAD’s unique retail gallery in Savannah, Georgia, has delighted window shoppers, tourists and collectors of fine art for the past decade. ShopSCAD carries an assortment of The Captain's Daughters collectable tins of tea. Collage Coffee is a vibrant pint-sized coffee shop in the Highland Park neighborhood of Los Angeles. Cruising down bustling York Boulevard, the shop might be easy to miss, but the exterior of their space is decked out with a mosaic of bright artist-designed tiles that are sure to catch your eye immediately! The Captain's Daughters tea is proudly offered on their drink menu and available for purchase by the tin. Sailor is a corner shop in the Ravenswood neighborhood of Chicago, edited by jewelry designer Sarah McGuire, an East Coast transplant who has been designing and handmaking her own fine jewelry line since 2003. In addition to her own jewelry, Sarah also represents other fine jewelers at Sailor as well as art and objects for home including an assortment of The Captain's Daughters teas. Blooming on Cape Cod as of May 2018 is Plant Work Shop, an Orleans, MA brick and mortar shop showcasing the herbal skin and home care line of Milisa Moses. This working studio is where Moses will develop the skincare and home cleaning products she creates, and where she will host her own hands-on workshops. Plant Work Shop offers a small assortment of The Captain's Daughters tins of tea for sale in Milisa's favorite flavors. Salte is a travel inspired, lifestyle shop on the island of Martha's Vineyard. Owners Lizzy Hynes and Tom Juster have a love of the ocean that inspires almost everything they do! SALTE sells a curated mix of home and personal accessories, including a curated selection of The Captain’s Daughters teas, along with their favorite travel finds from across the globe. They also offer design services and prop styling on island and off. Chef Liam Luttrel-Rowland can be found continuously changing Spindler’s menu to reflect Cape Cod’s seasonal bounty. He often choses to hand-pick ingredients for the day’s preparations. Located directly next door to The Captain's Daughters' boutique, Chef Liam uses The Captain's Daughters teas to create inventive tea-infused menu items like The Captain's Daughters Tea Cured Salmon. Baie Bar Resto is a small restaurant, set on a covered second floor deck, overlooking the bay in Provincetown. food and drink by a small staff who are dedicated to the creative craft of handmade. Baie Bar Resto proudly serves The Captain's Daughters tea on their beverage menu. Founders, Adam & Erica, after growing tired of city life in Brooklyn, recently relocated full time to Cape Cod. They acquired The Red Pheasant Inn from long time owners Bill & Denise Atwood and are dedicated to building upon the legacy the Atwoods' have created with their reinvention of the restaurant, The Pheasant, opening in Spring 2018. You'll find The Captain's Daughters tea proudly offered on the menu. 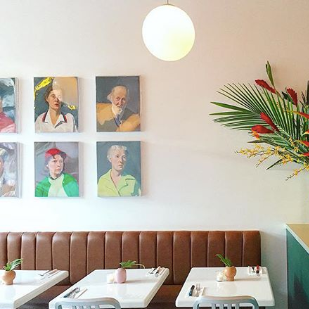 MeMe's Diner is a restaurant in Prospect Heights, Brooklyn serving dinner and brunch to their neighborhood. At MeMe's, they believe that cheese balls pair well with your martini, that eating out should be simple, and that you always have room for dessert. They work from an international pantry (think chili oil, fish sauce, and tahini) combined with farmer's market produce and bodega standards to create distinctly American food. The Captain's Daughters tea is proudly offered on Meme's menu in inventive combinations. Interested in stocking The Captain's Daughters teas? Find out more information here!